Dental implants are a perfect solution for missing teeth: they encourage new bone growth, are easy to care for, and look completely natural. If you’re a Flagstaff, Arizona resident or a resident in the surrounding areas, you can consider Dr. Williams to be your local implant expert. He has been treating your neighbors for years and he’s looking forward to helping you, too. If you’re ready to get rid of those embarrassing gaps, click or call to schedule your appointment at Northern Heights Dental. A dental implant is a titanium tooth root. 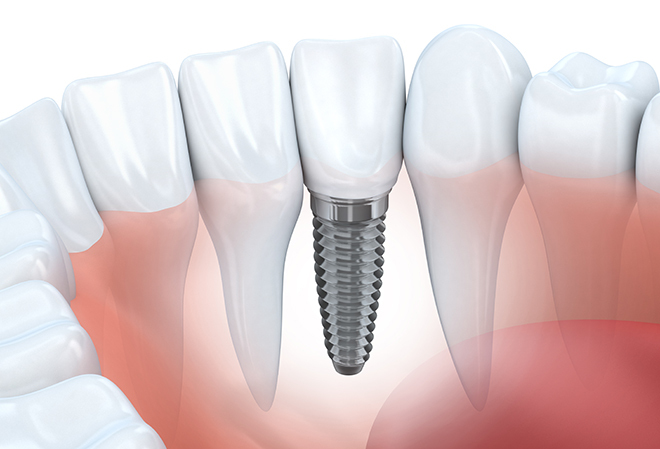 After your dental implant is placed, your bone will grow tightly around the titanium, creating a stable foundation that can be used to restore a single tooth or multiple teeth. Placement of dental implants in most cases is a very simple procedure, with very little post operative discomfort. Having your dental implant placed is typically much less invasive than tooth removal. Dr. Williams utilizes a variety of implant placement techniques to optimize healing and minimize post operative discomfort. These technologies include: Electromagnetically Driven Osteotomes, Piezoelectric Surgery, and Digital CBCT 3D guided surgery. What benefits do dental implants offer compared to bridges and dentures? Conventional dentures are only 30-35% as functional as your natural dentition. Similarly a bridge is only 75% as functional as your natural dentition, whereas implants restore 95-100% of functionality. Dental implants also stabilize and preserve facial structure by preventing bone loss. When a tooth is lost or missing your body will not maintain bone in the area unless a dental implant is placed. Implants require cleaning just like your natural teeth do. With diligent maintenance your dental implants can last a lifetime. This maintenance entails daily brushing and flossing and adhering to the periodontal maintenance schedule set by Dr Williams.